Within the context of cultures of assembly seeking strategies for ideological and structural change, the navigational imperative caught up in the notion of “dis-re-orientation” cannot be understated. This is the navigation of what could be in the face of what is, where what is denotes a zone of epistemic and ideological normativity that demarcates a particular social world to the neglect of alternative possibilities. Navigating the could be requires the conceptual, spatial and infrastructural construction of the inexistent (the creation of a map and a territory). Navigating what could be is both the definition of purposes of assembly along with the articulation of a new spatial condition for a logic unbound to the actual imperatives of the current landscape. What could be is not something to be unveiled, but a project of vast collaborative construction, engineering an alternative future emancipated from certain impasses that (in particular) define our time: a future captured by debt, rampant inequality and cataclysmic climate change. We need a new cartography for this speculative, inexistent territory if we are to attain a sense of orientation, and affirm other ideological horizons to incline us in logical and pragmatic cultures of assembly. This horizon, whether figured spatially or with regards to knowledge, must be intelligible and shareable; it is part spatial, affective, relational and metric, gaining value through imitation and repetition of use. Ultimately, what this notion of a horizon points to, is the basic definition of a model. 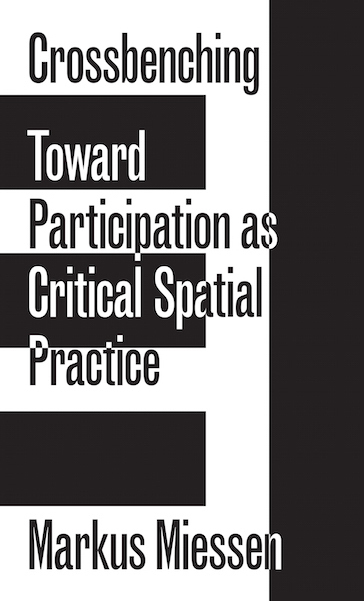 Patricia Reed, "Constructing Assemblies for Alienation" inCrossbenching: Towards Participation as Critical Spatial Practice, eds. Markus Miessen, Berlin: Sternberg Press, 2016, 95-107.